Includes: * Rechargeable Light Package * Rheohead * Battery. The Nite Sport LED is the perfect all-purpose utility light for hunting, fishing, camping and more. Versatile, compact, easy to use and weighing just under three pounds, Nite Sport II is popular with hunters and outdoorsmen alike. 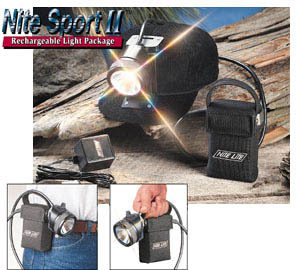 The Nite Sport II can be used as a hands-free headlamp, a hand-held lantern or a belt-worn walking light. Features include the RHEOHEAD headlamp with an adjustable beam & rheostat and the Nite Lite rechargeable 6-volt gell battery system. Package includes: RHEOHEAD headlamp with soft black corduroy cap, rechargeable battery pack, padded case and wall charger.